You’ll find little Saigons and Little Hanois all over the US, Europe, Australia and Singapore, but not in Hong Kong. A punishing immigration policy that favors those who will contribute significantly to the economy, coupled with the lack of space mean that the Vietnamese who came to Hong Kong were somewhat scattered. Without a home Vietnamese food struggled to become a mainstay in a city that loves foreign cultures, but times are changing. Can the Vietnamese-born chefs returning to Asia help put Vietnamese cuisine on the SAR’s map? Forced to flee their birth country from years of war and persecution, waves of Vietnamese refugees started to arrive in Hong Kong in the mid 1970s. They were accepted but officially labelled as illegal immigrants. Eventually many were able to gain refugee status and settled in Western countries, hence the prevalence of expat enclaves in other major cities. In Hong Kong is was a different story. Many immigrants were held in closed camps, effectively imprisoned behind barbed wire, even though they were seeking freedom. Many were sent back to Vietnam but some were allowed to remain and settle. All of this upheaval and multiple waves of immigration meant that the Vietnamese population was scattered. Many found themselves living among the Thai community around Kowloon Walled City where the customs and ingredients were perhaps more familiar. Others settled wherever they could afford to and many were left homeless and destitute. The names of Hanoi and Haiphong roads in Kowloon are some of the only clues to the history of the Vietnamese in Hong Kong, although you won’t find many Vietnamese restaurants on these streets. High rise shopping malls and posh hotels have forced all but the most stubborn of Cantonese sui mei shops out of the area. A relentlessly resilient people, having been through so much hardship, they persevered and did open restaurants, just not all in one area, and unlike other Asian cuisines, Vietnamese food was not a major part of the food scene until more recently. In order to survive some restaurants have been driven underground, serving up dishes from the homeland in their own homes. Locations are secret as the restaurants are operated without permits, but within the communities, everyone knows where to go and they surely serve up the most authentic Viet food in the city. As Vietnam’s food and culture has become more recognized globally, in Hong Kong restaurant concepts have sprung up that aim to rectify the lack of cohesion in the Vietnamese food scene. These are not typically run by Hong Kong’s Vietnamese population, they tend to be opened by restaurant groups that see an opportunity to fill a gap in the market. Rather than ‘Mom and Pop shops,’ they are more focused concepts concentrating on one aspect of the food culture or one particular dish. These are typically headed by Vietnamese chefs whose families had settled in other countries like Canada, Australia, the US and UK, aiming to bring the best of their experience of Vietnamese food to Hong Kong and start a conversation in the city. Over the years more restaurants have opened, and the quality has improved with the increased competition. These openings tend to be in the more affluent areas on Hong Kong Island or Tsim Tsa Tsui, but there’s still no Little Vietnam. For a long time, Hong Kongers could be heard complaining that the only Vietnamese food you get in the city was pho. 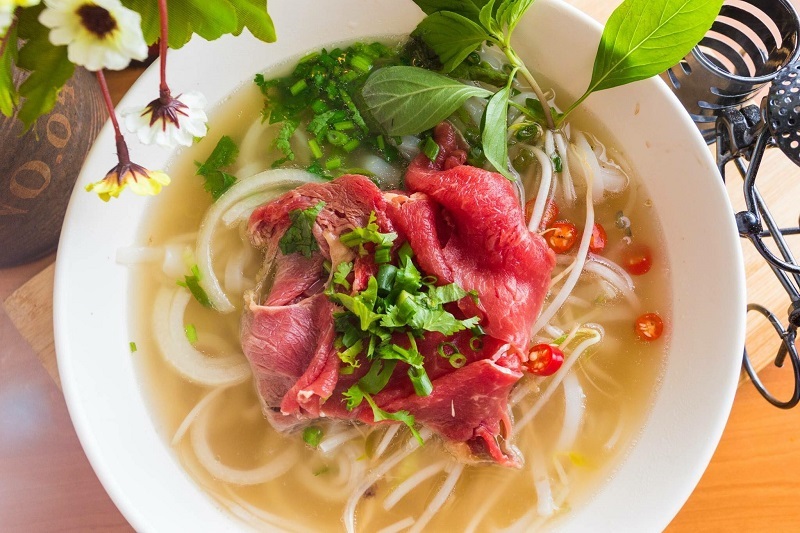 Perhaps restaurateurs were playing it safe, knowing that Cantonese, Japanese, Taiwanese and Thai noodle soups are always popular, and that pho would be too. Restaurants like Co Thang, Nha Trang and Bep followed, and helped to popularize the cuisine with a broader range traditional dishes of more consistent quality. 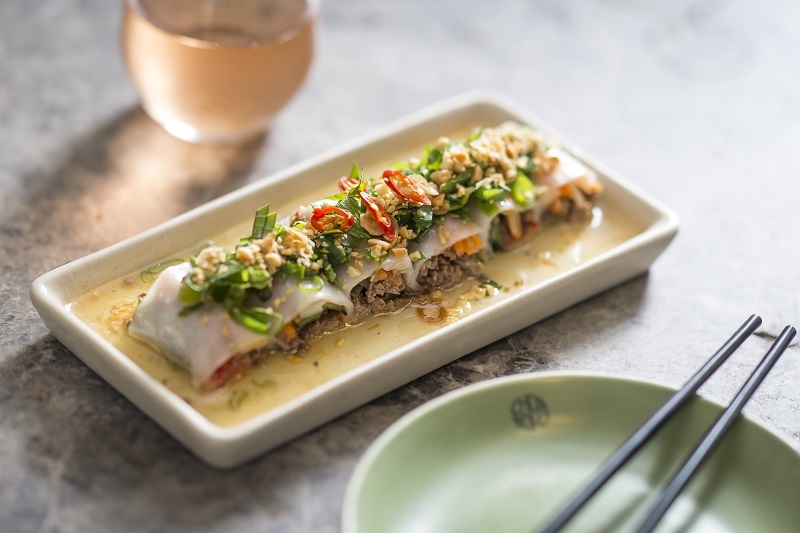 Last year, Australian-Vietnamese chef Luke Nguyen caused a major buzz when he announced the opening of Moi Moi in Hong Kong. The restaurant in Central aimed to showcase traditional dishes using the best ingredients available. Indeed Nguyen opened his first restaurant, Red Lantern, in Sydney at the age of just 23 and went on to make a name for himself with book deals and numerous television appearances. Nguyen has since moved on from Moi Moi but the influence of his TV chef status has had a lasting impact on the way Vietnamese food is seen in Hong Kong. His dishes are characterized by smokey meat and fish elements straight from the charcoal grill, inspired by the Southern Vietnam style. Mounds of fresh herbs and sweet, sour and funky sauces are the accompaniments and round out the flavors. He doesn’t serve pho, and says there’s more to Vietnamese food than noodle soups. Steve Nguyen, another Vietnamese-born chef heads up Chom Chom, a restaurant and bar based on the bia hoi tradition of Vietnam; all about fresh beer and street food served up in a casual setting. Growing up in Toronto, Steve was exposed to all kinds of cuisine but enjoyed traditional Vietnamese dishes at home with his family. “I think it’s at next stage of evolution, but still in its infancy. With a new generation of chefs like Bao and myself, and the folks who opened up Co Thanh— there are hungry and ambitious Viet chefs who want to represent and take it to the next level. Vietnamese people and the cuisine itself didn’t have the easiest of starts in Hong Kong, but as the world has become wise to the delicious variety and freshness of the food of Vietnam, a new wave of restaurants has come and taken advantage of the gap in the market. Happily with more chefs returning to Asia and reinventing the cuisine of their ancestors, the quality and variety of dishes is getting better and better, and it looks like Vietnamese food is here to stay. Vietnamese food is on the up in Hong Kong. Gone are days of moaning that you can’t get a good pho, or conversely, complaining that all you can get is pho. Vietnamese chefs are returning to Asia and reinventing the cuisine they grew up eating, bringing traditional recipes bang up to date. Here are three of the best restaurants in the city and their signature dishes. Le Garçon Saigon is headed by Vietnamese-Aussie Chef Bao La. Bao loves adding smokiness to meat and fish by grilling over charcoal and has developed unconventional techniques for tenderizing the flesh. 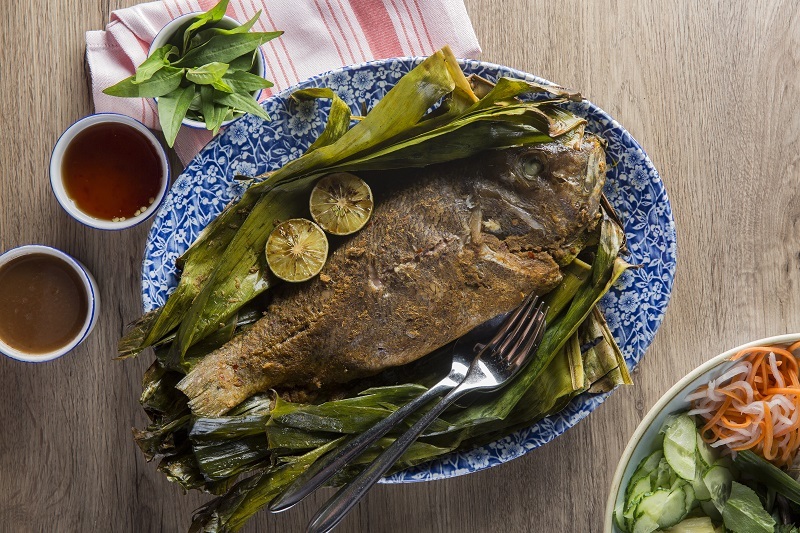 One of his signature dishes is yellowfin snapper, roasted in a banana leaf with lemongrass and chilli paste. The dish comes with a mountain of Vietnamese herbs and house-made sauces which add freshness and balance to the succulent main event. There’s plenty of rice paper to wrap everything up in for many a satisfying mouthful. Saigon Pho specializes in bowls of steaming noodle soup that are certainly worth a slurp. Located out in Sai Kung in the New Territories, they had to earn their reputation, but hungry pho fans still travel out to the beach side town to get their fix. There’s a range of options from angus beef to chicken, and a vegetarian pho, to one topped with squid cakes. It also serves rice and vermicelli dishes and typical Vietnamese appetizers like summer rolls and papaya salad. If you’re on the hunt for unpretentious Viet food made with passion and skill, it’s well worth the trip. Chom Chom, under the leadership of Canadian-born Steve Nguyen, provides Central Hong Kong’s hip Soho with the bia hoi experience. The carefully selected Vietnamese craft beers on tap may not be dayfresh or cost VND5,000 a glass but sitting out on the terrace is the closest you’ll get to sipping a fresh beer on a street corner in Saigon or Hanoi. The best part is you can enjoy your beer without worrying that it’ll lose its fizz. The menu features typical bia hoi accompaniments optimized with modern tweaks and top notch ingredients plus Chom Chom originals. The pho roll is a masterstroke. Tender braised beef, rich and full of umami, is offset with sharpness from pickled carrots and rolled up with rice noodles and thai basil with crunchy peanuts scattered on top. The whole thing is wrapped up in rice paper and is as satisfying a morsel as you could wish for with a cold beer. 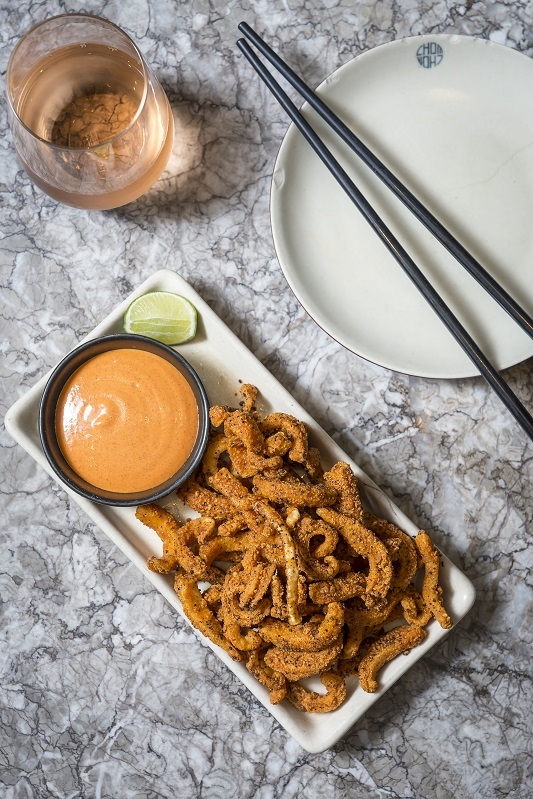 As is the salt and pepper squid, salty and crispy with a creamy kick from the funky fermented flavor of kimchi mayo. His inspiration comes from his family. He grew up in Toronto cooking all kinds of food, but it was his native country’s cuisine that they ate at home.